The author of the Slate article states that he doesn't participate in any customer loyalty program (airline, grocery, pharmacy, etc) because he doesn't think the value (economic or otherwise) offsets the inconvenience of carrying a card (or providing his phone number). He believes that loyalty card programs are "a crutch for bad businesses" and "only make sense in industries in which a company can do nothing to differentiate itself." Mind you, it's extremely hard to think of such an industry. (You can read the original article here). What are the benefits and drawbacks of our card program? Can we justify its continuation? If we can, what changes can we make to significantly improve it? First, What Is a Loyalty Card or Loyalty Program? Tesco got it right in 1995 when they launched their Clubcard note, not their "Loyalty Card". For their card is, first and foremost, an information card, not a loyalty card. Increased loyalty is a by-product of what they do with the customer information. From my perspective, card programs were introduced to provide retailers detailed customer activity data similar to what manufacturers, vendors, and other service businesses, such as banks, were already collecting. It seems that the reason the terms "Loyalty Cards" and "Loyalty Programs" keeps being used is that we know what is meant, despite the terms being inaccurate. Talking about a company's card program would be preferable. Another critical success indicator is whether the program is at the center of the company's marketing and merchandising and its pricing and promotions, regardless of whether their card program is price-, points-, or gas-discount-based. The program should be evident in every circular and communication, and in every store and aisle. The program's benefits are, of course, simply an alternative to traditional price reductions; hopefully, a more appealing alternative. For this reason, among the leaders in this field, the costs of a card program are charged against the company's Gross Profit and not treated as an expense item, allowing flexible, on-going trade-offs between card-based costs and traditional price reductions. The third success indicator lies in the mindset of the company. Companies with an analytical bias in their culture gain a great deal more than those where that bias is weak. As a consultant, this is quickly picked up when observing how detailed a company is with its regular store and financial reporting and how effective the reporting is in causing corrective action. This, of course, is a critical characteristic as a card program is all about generating customer data so that we can see, for example, when customers start shopping with us along with their changes in frequency and spending. If we are not using such data as triggers to communicate with customers, then it's fair to ask ourselves why not? After all, the point of the program is to measure and strengthen our overall and individual customer loyalty. Just as a great author writes to entice the reader to turn the page so does a great retailer operate his business to entice each customer to return. The more customers return, the more successful the business. Customer data allows us to measure that success, to go below the surface of sales and show us what is really going on. We have found, for example, that customer frequency is the single best driver of sales. Also, counter-intuitively, that as the typical customer's frequency increases so does his or her spending per visit and per week. It follows that programs and promotions that encourage frequency build sales. With customer activity data, we can see how our different customers respond so that we can tailor future promotions more effectively. As you can see, the more we can change our customer mix in favor of the Diamond and Rubies segments, the lower our overall defection rate will be. 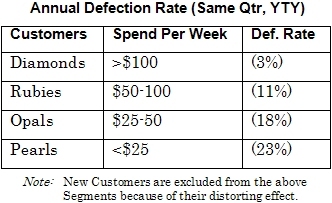 Customer data allows us to intelligently lower our defection rates. Knowing what segment (above) our different customers populate, allows us to introduce economic pricing, ie, offering lower prices to our higher-spending customers, both openly and below-the-radar, such as offers to customers via email. Safeway's success in this area with its personalized offers in its just for U program is the primary reason behind their recent announcement that they will abandon weekly newspaper ads in the near future. That decision alone shows how using customer data intelligently for marketing is so powerful. So Will A Card Program Materially Improve Your Results? It depends. It depends on the rest of your marketing mix; such issues as the location and ambiance of your stores, your service, quality, etc. And it depends on how well you structure, execute and use the information from your program. The global leaders in card marketing have executed well, built customers and sales, and have enjoyed financial success. They couldn't imagine operating without their card program. Card marketing isn't a fifth wheel. It's a commitment to building your business by better knowing your customers. It's a strategic choice.